The bathroom is the most personal room in the house. For this reason, it makes sense why homeowners wish to add privacy to this space while also making it more inviting. 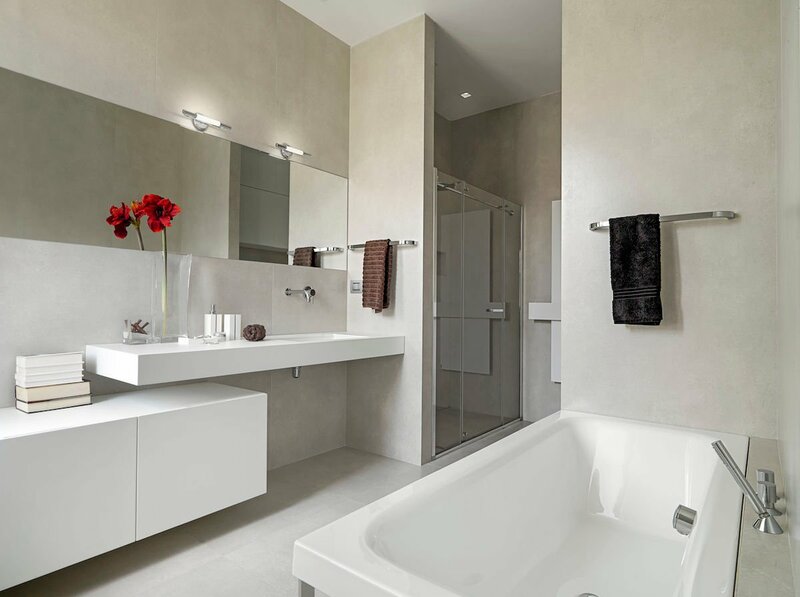 Whether it’s adding glass blocks to the shower or installing a partition wall between the tub and toilet, here’s how to make the bathroom more private without sacrificing space or style. Bathroom windows allow natural light and fresh air into the room. However, windows also expose the bathroom to the outside world, which can be a drawback. Privacy windows offer homeowners the best of both worlds. There are a number of ways to make windows more private, Jennifer Farley at Curbly writes. The easiest is to add drapes or curtains, customized to enhance the style of the space. Another idea is to use frosted paint or window treatments, which are easy to implement and allow both light and privacy. Frosted window film comes in a variety of patterns and styles, blogger Chelsea Johnson notes. She provides a step-by-step tutorial for how to apply the window film perfectly. If you’re not sure what window film can add to a bathroom, take a look at Johnson’s before and after photos. The film adds instant privacy without taking up any space in the already small bath. For something more permanent, textured window glass can do the trick. A combination of dimpled glass bricks and clear glass ensures privacy without sacrificing the view, interiors journalist Joanna Simmons writes. Dimpled glass isn’t transparent, allowing homeowners to install a bigger window. This lets in more light and expands the feeling of space. An even more modern design approach can be seen in an inner city home designed by Tobin Smith, design director at CoLab Architecture. Here, frosted glass comprises two entire walls of the bathroom. This lets in a great amount of light but also keeps the space private. Since there’s a glass wall on either end of the bathroom, light from the home’s landing streams in one side at night, while natural light enters the other side during day. Bathroom partition walls are a great way to separate the toilet from the bathing area. And, there are many materials and styles of bathroom partitions that can add an elegant flair without taking up too much space. One example of a classy bathroom partition comes from the architecture platform ZingyHomes. They show how a frosted sliding glass door can be used to divide sections of the bathroom. The frosted glass can be used to separate the toilet from the rest of the bathroom, or to separate the bathtub from the vanity. There are many ways to customize this type of partition, depending on your needs and desires. Glass bricks, popular in the 1980’s, are still a solid option for dividing space in the shower. Curved glass block shower walls, for instance, can be used to create a walk-in shower, explains Innovate Building Solutions president Mike Foti. These shower walls don’t typically reach the ceiling, so create more visual space. Colored glass blocks and glass tile blocks can be used to add more vibrancy and pizzazz to the bathroom. In fact, a glass block shower surround creates a dramatic look, says Nancy Mitchell, senior writer at Apartment Therapy. She shows how a shower enclosed by glass blocks allows light and keeps the space separate from the rest of the bathroom. Block size and glass texture variation within a block wall can be used to add interest and keep things dynamic. If your bathroom and master bedroom are attached or in an open floor plan, it might pay to get a bit more creative with your partition. For example, a wardrobe can be positioned between the bath and the bedroom, says Decoist lifestyle editor Sherry Nothingam. Since the people using the bedroom likely need space for clothing storage anyway, using a wardrobe as a wall is a smart way to use a single item for multiple needs. Plus, using a vintage or handcrafted wardrobe for this purpose can make the entire space more unique. A graphic wall or metal panel can create space in a more minimal way, too. A custom metal panel can separate two areas in a room, Cynthia Bowman at Freshome writes. While its design of vines and leaves doesn’t offer full privacy, it would work well in a smaller bathroom to visually separate two spaces. If you’re keen to create a more rustic atmosphere, it might be better to use wood partition walls. Wood room dividers come in a variety of styles. Laser cut wood, for example, adds to the aesthetics of the room and can reinforce other design elements, Sunita Vellapally at Homify explains. Wood patterned partitions should be sealed to protect from moisture; otherwise they’re a strong choice for adding space and privacy. And if it’s not rustic you’re after, painting these partitions gold or silver can amp up the glam factor. Another way to create privacy in the bathroom is to keep the toilet separate from the showering and bathing area. If you’re building a new home or remodeling the bathroom, this is an important design point to keep in mind. The location of the toilet has always been a matter of debate, design journalist Amelia Barnes writes. She explains that separating the toilet can assist with both hygiene and privacy. Plus, keeping the toilet separate frees up more space in the bathing area itself. Renovation firm and design blog Kyal and Kara points out a few pros and cons to this design. On the plus side, creating a designated toilet room allows people to use both the toilet and the bathroom at the same time. This is in contrast with bathrooms that have an installed toilet, which means that people have to wait to use the shower. Additionally, smells and germs from the toilet are contained in their own room, keeping the bathroom cleaner and more pleasant. Most toilet rooms have an entrance separate from the bathroom, but large, luxurious bathrooms reap the benefits of a separate toilet without sacrificing space, Curbed writer Jenny Xie says. The enclosed toilet room within a bathroom, sometimes referred to as a water closet, is more common in older homes in the UK, and can be controversial. Yet, it provides the ultimate luxury for homeowners who share a bathroom yet desire a private and clean bathroom experience.